I hate to jump the gun here, but I just can't help myself. Last week I started reading The Sun Also Rises by Ernest Hemingway. I'm loving every last word of it and have gotten to the point where I've started reading very slowly to stretch it out. A couple of summers ago I read The Paris Wife by Paula McLain and hated it. It's a fairly popular book that I always see posing for photos on instagram and blogs alike, receiving great praise from the commenters. Every time I read one of those comments that says, "I loved this book so much, it's the best, you're going to love it!" I shake my head and wonder why. What made them love such a dreadful tale? Why do they like it so much? WHY? What about it exactly is appealing? Sure, it starts out as a love story but things sour relatively quickly and after a series of horrible events Ernest finally abandons Hadley for her "friend", Pauline. And it's not like the author made you feel like you were in Paris in the 1920s either. The only descriptions, I feel, were of their dark apartment, not of the charming cafes or glittering lights. Pauline's behavior while they were vacationing with the Fitzgeralds, if I'm not mistaken, was enough to make me want to slam the book shut for good. Such an unpleasant subject matter is not appealing to me. I did not find reading about the demise of a relationship to be an enjoyable experience. As a result, I put off reading The Sun Also Rises since it tells Hemingway's side of the Pamplona affair. That is, until this summer when I decided I needed a good dose of the twenties. It's no secret that the 1920s ranks high on my list of favorite eras. It's such an interesting time in history, so much was changing socially, politically, and at the end of it came the Great Depression. 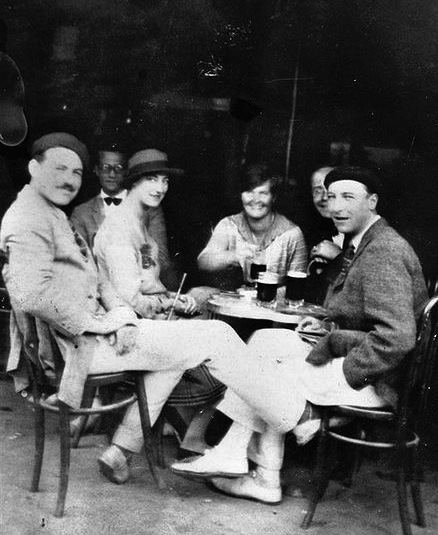 Then it's often romanticized by all of those wonderful artists and writers that converged upon Paris, Hemingway of course is no exception. One of the things I am enjoying most about the story is it's telling. I'm very much enjoying the prose, sentence structure, tone. I'm also enjoying noticing the little things that haven't changed over the years. For example, the characters go to a little restaurant that got into one of the American guide books. Now it's packed and noisy, fully of American tourists, not at all the same as they remembered, but the owner tells them that if they come at lunchtime it'll be empty. The same thing recently happened to one of my favorite spots in the West Village. Tiny place, very good food, now packed every night, lots of tourists. It's no surprise that it would be featured in a guide book, it's wonderful, but it is frustrating to no longer be able to get a table. But JD and I really should start expanding outside of the bubble. I'll write out a full review once I finish reading the book. In the meantime, if you have read The Paris Wife, please let me know what you thought of it.